Re-reading the Fantastic Four comics from the start. Issue #32 promises big drama on the cover, and the cover hyperbole gets it right this time. Once again, the story begins in Reed’s lab (how big is this lab of his, anyway? ), where he’s experimenting on another cure for Ben. It appears to work, except Ben loses his memory. Reed has no choice but to turn Ben back into the Thing, so Ben can have his mind back. Elsewhere, out in space, a “shimmering ray” shoots through the cosmos, “faster than a trillion laser beams.” It strikes the Earth, destroying a dormant volcano, and a strange figure flies out of the wreckage. The creature makes its way to New York, where it sneaks into the nearest jail, where Dr. Storm, Sue and Johnny’s father, is prisoner. 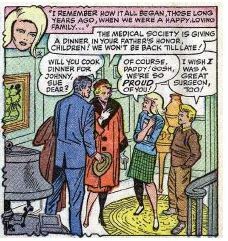 (You’ll remember that he showed up as a fugitive last issue, and turned himself in to the police after saving Sue’s life.) The creature transforms itself, so it looks just like Dr. Storm. The creature then conveniently transports Storm to the fifth quadrant of the Andromeda Galaxy. Visiting hours take an odd turn when Storm, is really the space creature in disguise, causes all kinds of trouble with his powers. Calling himself the Invincible Man, he appears to have all of the FF’s powers. Johnny fires a “4” flare (using the flare gun, not his fire powers like he usually does), summoning Reed and Ben. Losta fighting, as the Invincible Man, who gives himself a funky new villain outfit, makes short work of heroes, using their own powers against them. The Fantastic Four are forced (heh) to retreat. 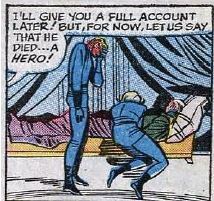 The Invincible Man commits a bunch of crimes, with the public believing Dr. Storm is responsible. Reed returns to the lab, determined to find a solution. 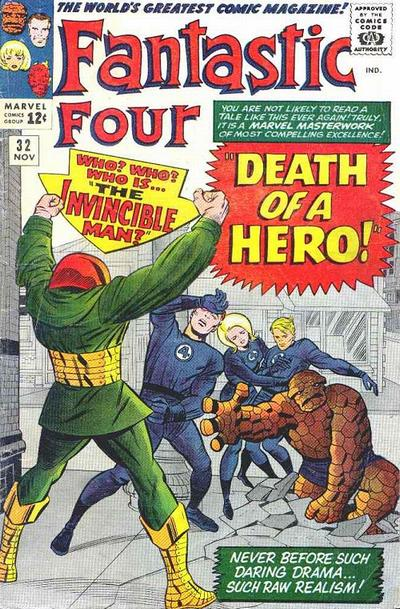 His invention du jour is a big backpack that holds an “ultra-sonic radio transmitter.” The FF confront the Invincible Man at the World’s Fair, where Reed uses his new device to reveal the truth – the Invincible Man is really the Super-Skrull, last seen trapped under that volcano back in issue #18. Reed takes an entire page to explain how he figured this out, and that the beam at the start of this issue came from the Skrull homeworld, where Dr. Storm is being kept hostage. Unstable molecule: Reed is downright obsessive in this issue, as if he’s got some kind of need to prove himself better than the Super-Skrull, snapping at Sue as he tinkers in the lab. He’s a man of action as well, putting his powers aside and delivering a heck of a right cross to the bad guy. Fade out: Knowing her family’s back story reveals a lot of what we know about Sue. She’s the “mom” of the group, because she had to grow up real quick after losing her mom and essentially losing her dad all at once. Clobberin’ Time: The Ben-is-human-again-but-loses-his-memory thing is a lot of high drama that doesn’t lead anywhere. Flame on: Johnny does very little in this issue, just occasionally chiming in from the sidelines. How much longer until we get a Torch-centric issue? 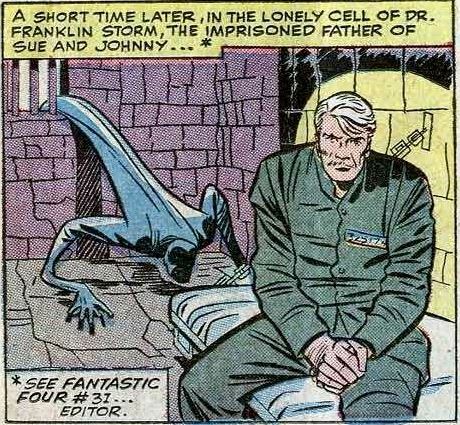 Trivia time: Dr. Storm’s first name is Franklin. How’s that for foreshadowing? The World’s Fair in this issue is the 1964-65 New York World’s Fair. 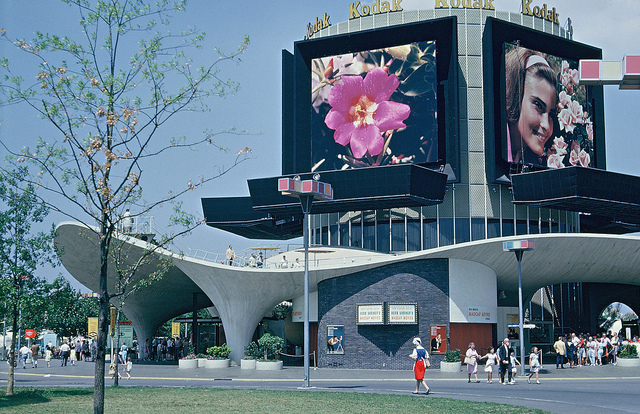 With its curvy roof and huge screens, the building drawn in the background is clearly the Kodak exhibit. Fantastic or frightful: Again, the Super-Skrull doesn’t show a lot of personality, as his only motivation is to take down our heroes. The tragic fate of Dr. Storm shows that the creators were pushing to create some real human drama in these pages – something more than just the ol’ tights n’ fights. Next week: Stay tuned for Attuma! This entry was posted in Fantastic Friday. Bookmark the permalink.